There is really nothing quite like the smell of freshly baked breads, cakes, and pastries warm from the oven and wafting through the air to put happy thoughts in your mind. But sometimes, especially as a beginner baker, we make a mistake, a baking faux pas so to speak, without even realizing that we are making an error. Here’s one example that tends to crop up in baking: what does it mean to properly cool a cake. Have you ever been tempted to let a warm cake cool in the tin for only a few minutes before trying to frost it right away? Ever taken a cake that has cooled down slightly and turned it over onto to a solid plate, only to discover later that the once-warm baked good is now wet on the bottom where the steam could not escape and instead turned to water? If you have, you will notice one common theme – trying to speed up the cooling process that baked goods need to go through does not work! Failing to properly cool down a cake that has just been removed from the oven will leave you with a mess of cake: a soggy, wet, sagging cake and one that melts the frosting as soon as it’s applied. This is to ensure that you do fully allow your goodies to cool down. Placing on a plate or leaving in the tin doesn’t allow the bottom (or sides) to release the hot air. 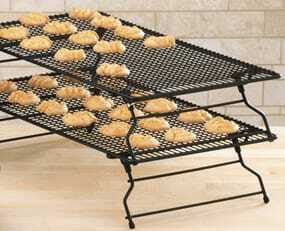 And just to clarify the baking rack that we are talking about is not the same as the oven rack (the rack that stays in the oven and supports the cooking food). And that’s the purpose of a baking rack: to allow the steam to escape from all sides of the cake simultaneously. Have you noticed that when reading through your recipe a statement along the lines of “let the cake cool for 10 minutes, then turn onto wire rack” and ever wondered what that means? But first, we need to truly understand what is causing the issue. Let’s take a look at a quick (but important) baking tip. The reason for a soggy and sagging cake is because the baked good was not able to completely cool down after being removed from the oven. A baked good that doesn’t have the chance to fully cool on all sides becomes wet since the hot steam isn’t allowed to escape and the trapped steam then condenses back into water. Ok now that we have that straightened out, you may be wondering if you can just pull out your oven rack and use that (once it’s cooled) to air your goodies? Are baking racks really necessary? Although at first glance it may seem that there are many similarities between your oven rack and a baking (cooling) rack there are quite a few key differences between them that really will end up affecting your baking negatively. Besides, a quick look at baking racks that are sold online will show that they will bean inexpensive addition to your kitchen so there is no good reason for not having at least one. 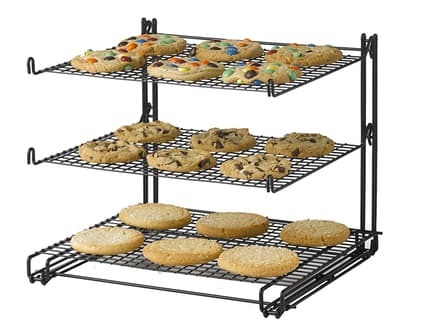 There are a couple of factors to consider when selecting a baking rack, including whether to purchase a set or a single baking rack, the size of the baking rack, grid size, and the material the rack is made out of. Whether you choose a single rack or a baking rack set consisting of multiple racks will really come down to your particular baking needs. A typical double or multi-layered cake, or a recipe for two dozen muffins or cupcakes may require a set of racks, as opposed to just one, in order to cool down the goods simultaneously. If you bake often, have a large family, or prepare for parties you may also get more use out of purchasing a set. Although the saying goes “less is more” in this case, it’s advisable to have an extra one for when the time calls for it. 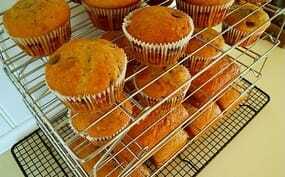 In fact, many baking racks will be sold in a set and still remain affordable. What if I don’t have space for extra baking racks in my kitchen? Don’t worry if space in your kitchen is limited! 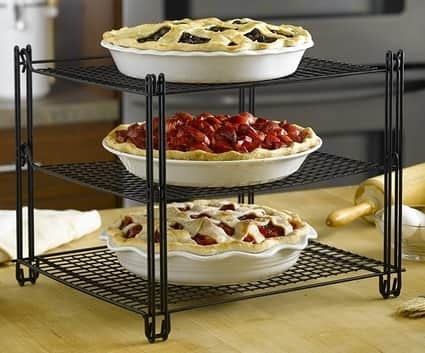 Some baking racks, for example the Sunbeam 3-Piece stackable rack set, are designed with that challenge in mind. As the name suggests, this set has much longer feet so that each layer stacks over the one below, saving you counter space while still allowing plenty of air through to cool down your freshly baked goodies. 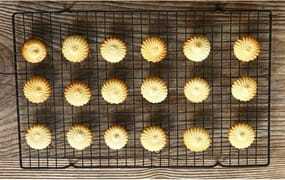 One inexpensive set, the Baker’s Secret (set of two) nonstick cooling rack for example, will let you choose whether to purchase two, three, or four racks in a set. Whichever best suits your needs and budget. 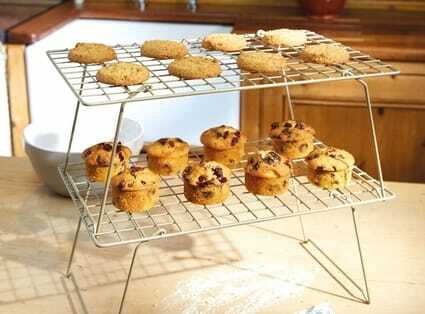 As you have already seen, a baking rack should be a staple in any baker’s kitchen. 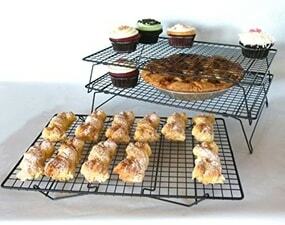 Another consideration when purchasing a baking rack is the size needed. Again, as with determining whether to buy a rack set or just one, look at what your needs are as well as how much space you have. Some backing racks may be listed by the quantitative measurements (for example, 10 x 15 inches) or they may be measured according to a pan size (such a half or quarter sized baking sheet). Baking racks are manufactured with the metal wire running in two ways which intercept each other, called crosswires. As their name implies, these wires run perpendicular to each other, crossing over each other, one set horizontally and one set running vertically so that they create a grid pattern. This is different to the rack that is in your oven which only has one set of wires on which to place a baking or roasting pan/dish on. 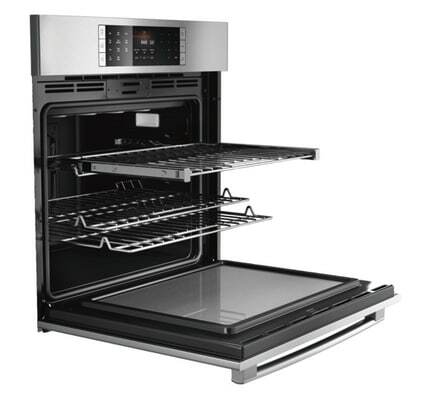 In the case of your typical oven rack, its only duty to fulfill is as a resting place so fewer wires are needed, though they need to be thicker and more robust to withstand the heavier weight and significantly higher temperatures endured in an oven. 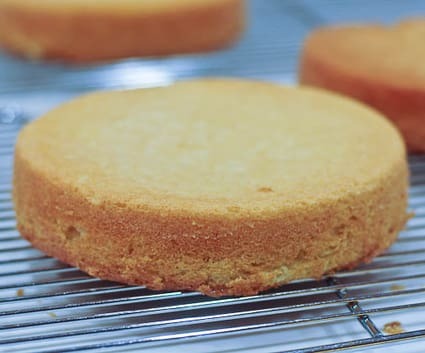 The sole responsibility of a baking or cooling rack on the other hand is to simply hold a pan-less cake off the counter so that it can cool down on all sides at the same time. To complete that task, a baking rack needs to be made in a grid size. Quick question: have you ever tried to use a cold rack from your oven in lieu of a baking rack? If so, you may have noticed that a cake that is still warm forms to the rack and ends up falling or sagging in between the wires. Once your baked good has cooled you can “peel” the cake off the rack and even still frost it, but it won’t be visually appealing! The misshapen cake will still taste fantastic, but you probably want to save it for your child’s after dinner treat rather than serve it to your guests! The difference between a cake sagging between the wires and one that holds its shape as it cools comes down to the smaller grid pattern. 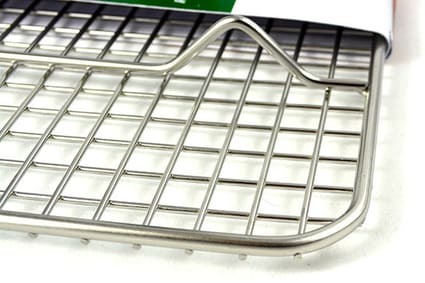 We love the Bellemain cooling rack, which has 40% more crosswires than their competitors. The narrow grid pattern ensures that even the most delicate baked goods do not sag, droop, or drop while also keeping enough air circulating underneath the racks. 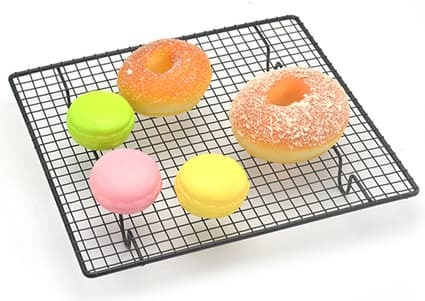 So as you can see, it is important to be on the lookout for a baking rack that has a tight grid pattern. 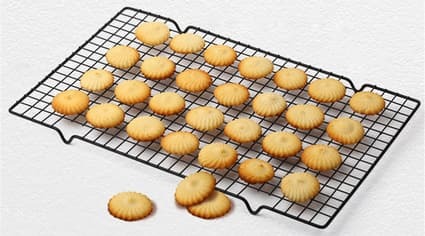 One of the greatest reasons why amateur bakers do not use a baking rack is because of the perceived mess; it’s just one more item to clean afterwards! And yes, there are no two ways around this issue, you will have an extra tool to clean up, but hopefully by now you have seen how important this item really is to your baking! It’s also all the more reason to grab a rack that is easy to clean so look for a rack made with a non-stick material which will be important when it comes to washing up time! Most baking racks are made from chrome (or chrome plated), stainless steel, or iron (more on why iron baking racks comes in handy a little later in the post). The manufacturer’s details will let you know if it a non-stick as this is definitely a selling point! Another feature to look out for is one that is no-snag (or snag free); check that there are sharp edges or parts that will catch on clothes or skin. Although you will probably primarily want to use your baking rack for baking, if you purchase a sturdier iron rack you may also be able to use it to keep heavier items, such as a pot or pan. If you are interested in a more “multi use” rack (one that can withstand a heavy pot) be sure to heed the manufacturer’s instructions; and look out for a rack that has more than four “legs” or touch points which will help it to stand up under the heavier weight. Just a quick note: unless the manufacturer has specifically stated that your rack can be used in the oven, assume that it can’t be! 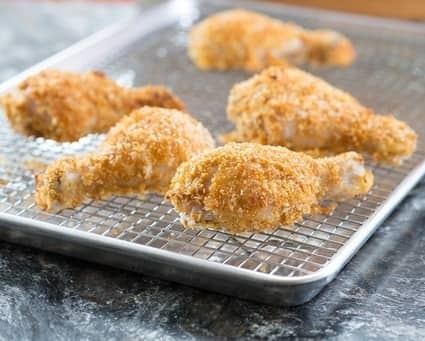 Honesty, most of the well-made yet inexpensive racks (such as this perfect 10 x 16 inch nonstick rack set from Baker’s Secret), are actually made with a coating that will peel off in the oven, rendering it worthless. A higher quality baking rack such as this 100% stainless steel set by Ultra Cuisine is noted as being oven safe for cooking, roasting, and grilling, will not rust and is safe to be washed in a dishwasher. 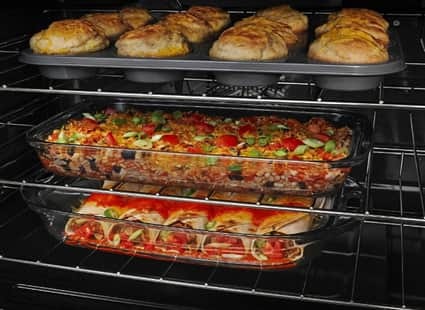 However, don’t let your decision be swayed too much by a rack that can be used in the oven if what you are really looking for is a cooling rack for your baked goods! It’s just a nice added extra though, and does show the robustness of the item. Although no guarantee will cover misuse of a product (such as placing in a hot oven when it is not rated for that type of use), do look out for a warranty that covers normal wear and tear of the item. 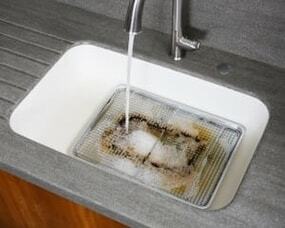 As with other ideas, double check whether the rack you purchase can be cleaned in the dishwasher (especially with coatings that could peel off) or whether there are other cleaning instructions. Remember to thoroughly dry the racks as soon as possible after washing to ensure to help prevent rust. We always suggest looking at a warranty offering a full refund or replacement is also a great extra and often worth a higher price tag compared to an item that is not going to stand the test of time.